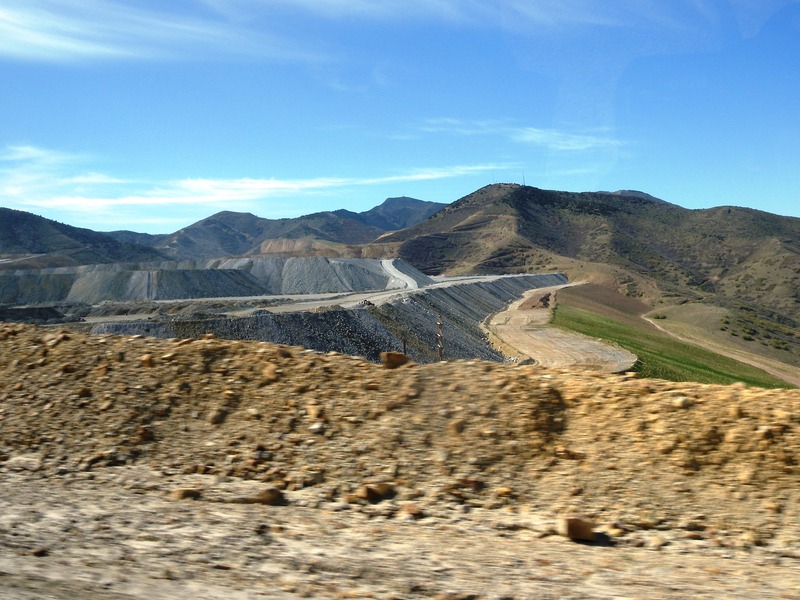 Linda Burton posting from Salt Lake City, Utah – The claim is that only two man-made creations on Earth are visible from the Space Shuttle – the Great Wall of China and the Kennecott Open Pit Mine in Utah. We have an image in mind of The Great Wall, so our imagination begins to stretch to visualize just how BIG an open-pit mine would be to be visible from outer space. It is two and three-fourth miles across, and three-fourths of a mile deep; set a Sears Tower at the bottom, stack another one on top of that, and they would not reach the top. 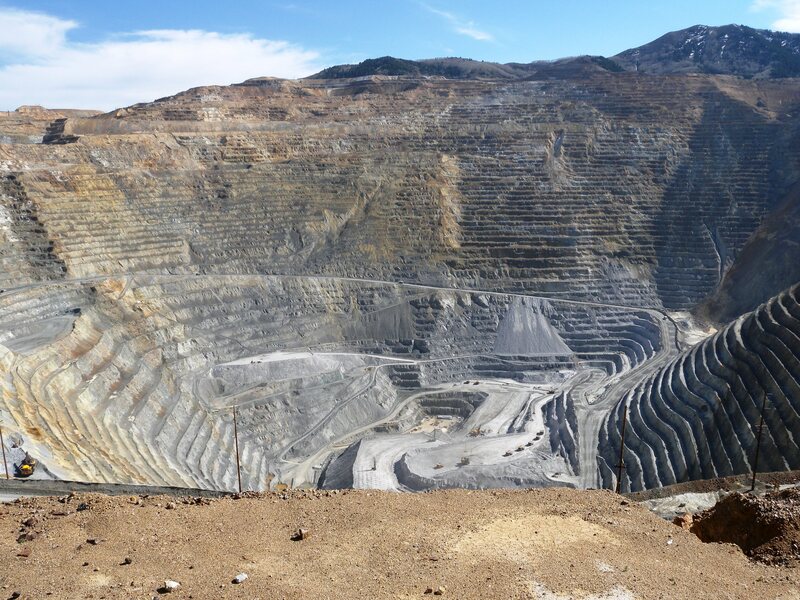 The official name of this big hole is Kennecott Utah Copper’s Bingham Canyon Mine and here’s another boggler – it has produced more copper than any mine on earth; about 19 million tons so far, and still going strong. Heavens sake, what do we do with all that copper? Well, your house has about 500 pounds of copper in it – mostly in wiring and water pipes. Copper is in your car, your computer, your telephone. On average, each person in America uses about 30 pounds of copper a year! 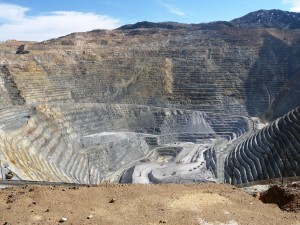 But copper isn’t all that comes out of the Bingham Canyon Mine; every year it produces 275,000 tons of copper, 400,000 ounces of gold, 4 million ounces of silver, 25 million pounds of molybdenum, and 1 million tons of sulfuric acid, which is a by-product of the smeltering process. 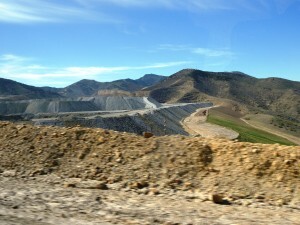 “I used to drive a truck here,” Ken told us, as he explained the mining process on the drive out. 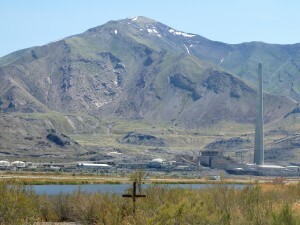 We left I-80 at the smelter near Magna. 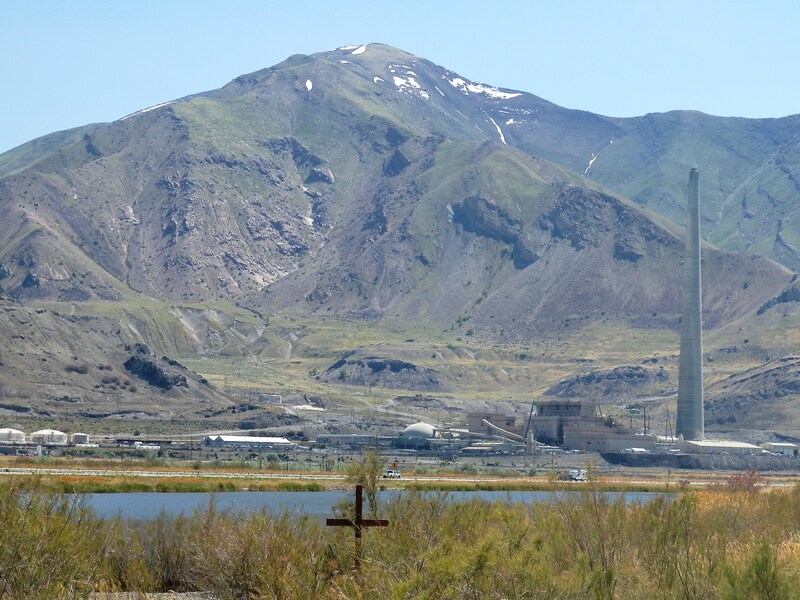 Ken pointed to the smokestack, a large curving chimney, 1,215 feet high (tallest free-standing structure west of the Mississippi, 4th tallest in the world), that was built in 1974 when the EPA cracked down on air pollution. It’s a scrubber, removing sulfuric acid from the gases released in the smeltering process. Train cars were lined up on the track to carry that away. “It’s used in things like car batteries,” Ken said. An operation this big is also messy, after all, a mountain is being dismantled, layer by layer, the ore removed, and the remains dumped somewhere else. In an orderly, well-controlled fashion of course. It is a thing to see; to peer into that deep, deep hole; the Visitor Center presents an overview of the mining process from the moment of blasting to the shipping of the 99.99% copper plate; read about it online too. Nothing you see relates to human scale until you consider contributions to the community and the jobs it provides. 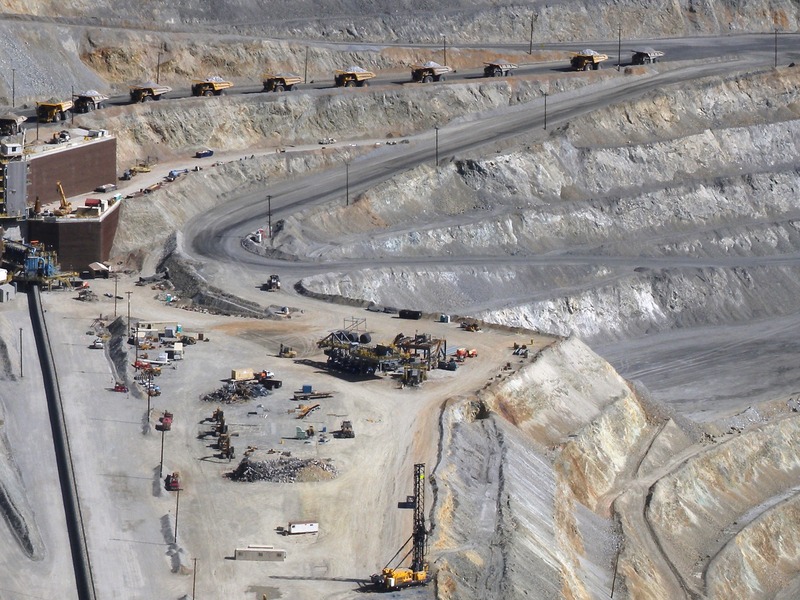 Owned by Rio Tinto now, it employs 2,400 people and impacts 14,800 indirect Utah jobs; each year it spends $1 billion in the state of Utah in wages, benefits, taxes, and purchases from Utah area businesses. It’s evident; on our drive back to the city, we passed through miles and miles of new home construction; schools and businesses springing up in the valley east of the Oquirrh Mountains. Back in my room, I read the brochure handed out at the visitor’s gate. Fascinating stuff.